(NaturalNews) Lending further credence to the notion that autism spectrum disorders (ASD) are directly related to an imbalanced or damaged gut, a new study out of the California Institute of Technology (Caltech) has found that mice diagnosed with ASD experience substantial improvements when given treatments with probiotics, a finding that could translate to humans. 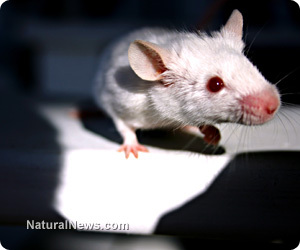 According to Science Daily, ASD mice with "leaky" guts, a condition commonly seen among humans with ASD, were essentially healed of many of their symptoms after undergoing treatment with a strain of probiotic bacteria known as Bacteroides fragilis, which is an anaerobic bacterium found naturally in the healthy human gut. Using a mouse model of autism previously developed by other researchers at Caltech, Professor of Biology Sarkis K. Mazmanian reproduced a scenario often seen in humans, where mothers with severe viral infections experience a unique immune response that makes them more prone to giving birth to children with autism. Using viral mimicry, the team induced a similar immune response in mice, resulting in the same core behavioral symptoms observed in autistic offspring. Just like in humans, many of the "autistic" mice observed as part of the study developed strange gastrointestinal (GI) abnormalities, including leaky gut syndrome. This condition, which as mentioned earlier is often present in humans with ASD, allows food and other materials to pass whole through the intestinal lining, essentially poisoning the blood and leading to many of the behavioral problems typically attributed to autism. "To our knowledge, this is the first report of an animal model for autism with comorbid GI dysfunction," stated Elaine Hsiao, a senior research fellow at Caltech and lead author of the new study, which was recently published in the peer-reviewed journal Cell. After successfully reproducing the ASD scenario in the test mice, the team decided to further investigate and verify that the mice's GI symptoms, indeed, influenced their ASD symptoms. To do this, they decided to test the effects of B. fragilis, an investigational probiotic that is part of a larger research endeavor being carried out at the school, in the mice. Much to their surprise, the team found that the ASD mice with GI problems that were treated with B. fragilis experienced a complete healing of their leaky gut issues. In essence, by restoring this important probiotic bacteria, which is crucial for nutrient metabolism and intestinal protection, the team facilitated major health improvements in the affected mice. "The B. fragilis treatment alleviates GI problems in the mouse model and also improves some of the main behavioral symptoms," explained Hsiao. "This suggests that GI problems could contribute to particular symptoms in neurodevelopmental disorders." With the help of clinical collaborators, the team hopes to replicate these same findings in actual human models to see how probiotic strains like B. fragilis might help children with autism. One thing is for sure: based on the findings of this latest study, it appears as though previous assumptions about the root causes of autism are seriously flawed, and that GI issues are closely interrelated with ASD symptoms. "Traditional research has studied autism as a genetic disorder and a disorder of the brain, but our work shows that gut bacteria may contribute to ASD-like symptoms in ways that were previously unappreciated," concluded Prof. Mazmanian, essentially affirming the groundbreaking research of GI expert and gastroenterologist Dr. Andrew Wakefield, whose reputation and career were destroyed after he linked certain vaccines to gut abnormalities associated with autism. "Gut physiology appears to have effects on what are currently presumed to be brain functions."